Step 1 Pat the lamb dry, place it on a platter and cover it with the sea salt. Let it rest in the salt for 2 hours. Step 2 Rinse the lamb and pat it dry. In a small bowl, combine the herbes de Provence, dried ginger and dried jalapenos (if desired). Add the olive oil and stir well to combine into a paste. Massage the paste into the lamb, covering it completely. Let it sit for 30 minutes. Step 3Place the lamb on the grill and cover the barbecue, leaving the vents open. Grill the lamb, turning it every 15 minutes or so, for about 1 hour and 15 minutes for medium-rare. Adjust the vents and add wood as necessary to maintain slow, even heat. Step 4Remove the lamb to a platter and let it rest for 20 minutes. To serve, slice the lamb across the grain, drizzle with 3 tablespoons of the garlic-herb oil, scatter the confit garlic cloves over and around it, sprinkle with fleur de sel and garnish with the grilled vegetables. In Recipes-list.com we have selected the most viewed recipes from category - Grilled Main courses . Enjoy the best recipes specially selected for you! 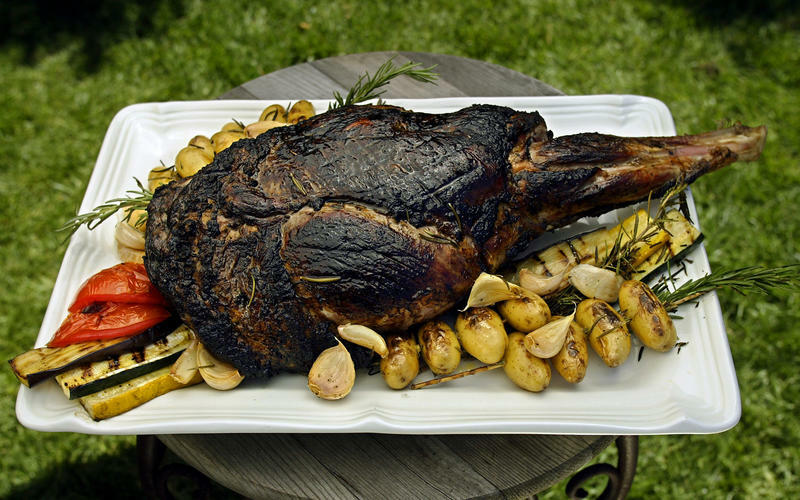 Barbecued leg of lamb with garlic confit, rosemary fingerlings and grilled vegetables is the right choice that will satisfy all your claims.